Location: Nasik/ Mumbai / Chennai (position finally moves to Chennai). 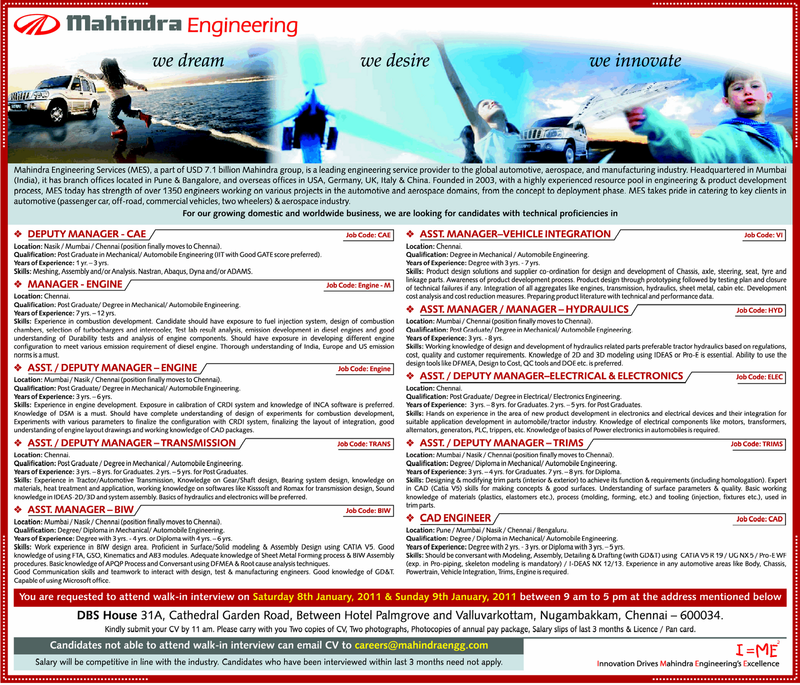 Qualification: Post Graduate in Mechanical/ Automobile Engineering (IIT with Good GATE score preferred). Years of Experience: 1 yr. - 3 yrs. Qualification. Post Graduate/ Degree in Mechanical/ Automobile Engineering. Years of Experience: 7 yrs. -12 yrs. Qualification: Post Graduate / Degree in Mechanical / Automobile Engineering. Years of Experience: 3 yrs. - 8 yrs. for Graduates. 2 yrs. - 5 yrs. for Post Graduates. Location: Mumbai / Nasik / Chennai (position finally moves to Chennai). Qualification: Degree/ Diploma in Mechanical/ Automobile Engineering. Qualification: Degree in Mechanical / Automobile Engineering. Years of Experience: Degree with 3 yrs. - 7 yrs. Location: Mumbai/ Chennai (position finally moves to Chennai). Years of Experience: 3 yrs. - 8 yrs. Qualification: Post Graduate/ Degree in Electrical/ Electronics Engineering. Location: Mumbai/ Nasik/Chennai (position finally moves to Chennai). Years of Experience: 3 yrs. -4 yrs. for Graduates. 7 yrs. -8 yrs. for Diploma. Location: Pune/ Mumbai/ Nasik/ Chennai/ Bengaluru. Qualification: Degree / Diploma in Mechanical/ Automobile Engineering. Years of Experience: Degree with 2 yrs. - 3 yrs. or Diploma with 3 yrs. - 5 yrs. DBS House 31A, Cathedral Garden Road, Between Hotel Palmgrove and Valluvarkottam, Nugambakkam, Chennai -600034. Kindly submit your CV by 11 am. Please carry with you Two copies of CV, Two photographs, Photocopies of annual pay package, Salary slips of last 3 months & Licence / Pan card. Salary will be competitive in line with the industry. Candidates who have been interviewed within last 3 months need not apply.